The contorted curving profile of this luxury building merely sets the tone for the awe-inspiring units within. Regal, without being stuffy, this building is home to the best of the best in layouts, views, and finishes. 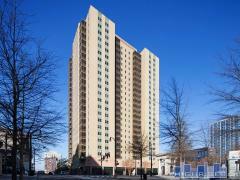 The Sovereign is one of Atlanta's most architecturally significant high-rise buildings. With only 82 homes in the entire building, it is one of the most exclusive as well. Luxury amenities at the Sovereign include a vanishing edge pool, Buckhead Club, conference room, concierge and guest suites. Have any comments or questions about Sovereign Condominiums? Ask your question and/or share your thoughts about this Building. What are the terms? Are there leases, mortgages, monthly, and how much? And what are the rates? Thanks! How much is the penthouse?